Through a selection of stark monochromatic photography and video art, Hudson Valley MOCA presents Death is Black and White: Selections from the Marc and Livia Straus Family Collection. The exhibition takes a focused look at how the examination of mortality illuminates what it means to be alive. Death is Black and White is being shown in conjunction with Death is Irrelevant, an exhibition of contemporary figurative sculpture, opening simultaneously in Hudson Valley MOCA’s main gallery. With imagery that is delicate yet unflinching, Death is Black and White shows people at their most exposed. Each piece captures the subject’s fallibility, humility or drive to succumb to their most perilous impulses. 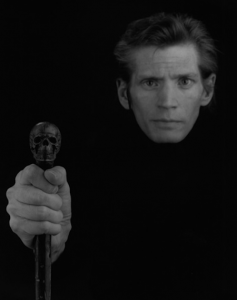 Noted American photographer Robert Mapplethorpe stares fearlessly out of the frame of a self-portrait, reaching through a shroud of darkness to grip a skull-topped cane. The power of his gaze is belied by his looming death from AIDS. A selection of images from Larry Clark’s Tulsa series form an autobiographical tour through the artist’s adolescence, populated with a disturbing contradiction of intravenous drugs and traditional Midwestern family life. Curator, Sarena Straus, and her brother Ari Straus, children of the museum’s founders, are immortalized on large Polaroid film, images by Lyle Ashton Harris, and legacies that transcend time and generations.